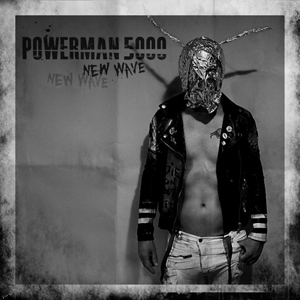 POWERMAN 5000 released New Wave on October 27, 2017, via Pavement Entertainment. Pick up the album at Best Buy, specially priced at $7.99, and at all other digital and retail outlets everywhere. New Wave is POWERMAN 5000’s eleventh official release since forming in 1992. The new album marks the next chapter in the world of PM5K and is the follow-up to 2014's highly successful Builders Of The Future. On the direction of New Wave, vocalist Spider One says, "We went a bit dirtier on this one. Ripped it up more than the last couple of records. One of the goals was to recreate the noise of the live show. Keep in the chaos." In addition to the album release, the band is also releasing the video for "David F**cking Bowie". The song embodies the spirit of the late David Bowie, leaving the listener with an incredibly powerful and human experience. Spider comments, "Bowie really was the best example of how to do it. He transcended genres and made everyone else seem average. This song is basically a big thank you." Watch the video on KNAC.COM right HERE. Don't miss POWERMAN 5000 on tour throughout October and November! Hear all of your favorites, as well as songs from New Wave. For the latest tour date listings and updates on the LA Comic Con appearance, visit the band's official Facebook.